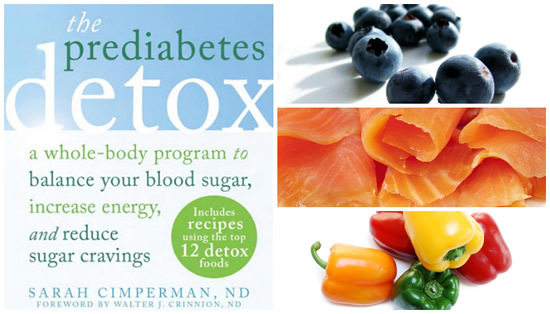 The Prediabetes Detox was created by naturopathic physician Sarah Cimperman, ND. Prediabetes means having high blood sugar and/or insulin levels. It increases your risk for developing diabetes as well as a variety of chronic illnesses including heart disease, cancer, and dementia. Studies have shown there is a direct link between toxins in our food and diabetes. In this book you will learn how to reverse prediabetes by…. The Prediabetes Detox Diet outlines a lifestyle guide including an eating plan, nutritional supplement regime and exercise program. Participants should follow the prediabetes detox program for two to eight weeks until your blood sugar levels are normal. Fast carbs are the most dangerous foods for people with prediabetes. They are quickly digested and rapidly absorbed, which increases blood sugar and triggers release of high amounts of insulin. This in turn can trigger weight gain, food cravings and fatigue. Chronic or long-term inflammation promotes diabetes and may be caused by a number of factors. One of the most important is the consumption of unhealthy fats such as heat-extracted vegetable oils, margarine, fried foods, and roasted nuts. Pro-inflammatory fats are also found in meat, eggs and dairy products from grain-fed animals. Studies have identified six different toxins in food and water that are associated with an increased risk of diabetes. The detox program outlined in this book can assist with the elimination of these toxins. Dieters can expect to eat the following foods on The Prediabetes Detox Diet. Wild salmon, lamb, clams, mussels, chicken, eggs, yogurt, cheese, tempeh, hummus, red beans, ground flaxseeds, pistachios, coconut, olives, avocado, broccoli, cauliflower, red pepper, spinach, mushrooms, beans, strawberries, blackberries, green tea, stevia. Exercise helps reverse prediabetes by reducing inflammation, lowering blood sugar and making cells more sensitive to insulin. It also supports detoxification by burning fat, mobilizing toxins and increasing lymphatic circulation. The Prediabetes Detox Diet says to get blood sugar and insulin levels under control you should exercise for five hours each week. Once your health becomes more balanced you may be able to reduce this to three hours a week. It is important to undertake a combination of cardiovascular activity, strength training and stretching. For people with high blood sugar the combination of aerobics and strength exercises is more powerful than either one alone. The Prediabetes Detox: A Whole-Body Program to Balance Your Blood Sugar, Increase Energy, and Reduce Sugar Cravings retails at $16.95. Offers a natural alternative for the prevention and management of prediabetes. May reduce the level of toxins in the body. Can result in improvements in a wide range of chronic health conditions. Provides educational information about detoxification and prediabetes. Many dieters will experience uncomfortable detox symptoms such as fatigue, headaches, nausea and mood swings in the initial stages. Requires the use of nutritional supplements, which may be expensive. Limits the intake of many foods generally regarded as healthy including fruits and whole grains. Does not include a meal plan option for vegans. The Prediabetes Detox Diet is a program designed to reverse prediabetes by addressing the contributing diet and lifestyle factors. Eliminating toxins, avoiding fast carbs, and reducing inflammation deals with the root causes of this condition to provide a permanent solution. This will not only assist in the management of prediabetes but will also reduce the risk of a wide range of other chronic diseases.